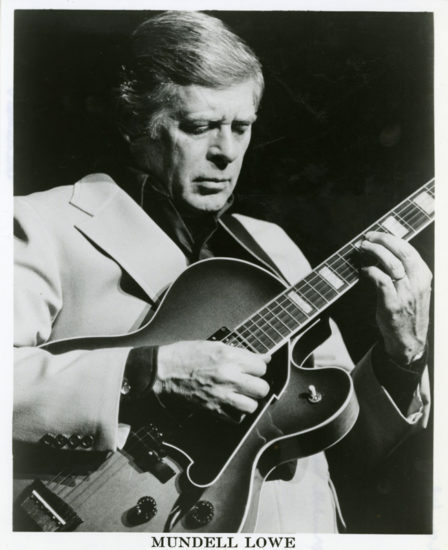 I first met Mundell Lowe in the early ’90s, at the Main Street JazzFest in Columbia, S.C. He quickly became a regular over the festival’s 11-year run. I made the festival most years, playing bass and occasionally singing with Mundell. We got to be friends, and Mundy became a mentor. Years later, after my first CD release, I got a note from a fan in Los Angeles asking if I’d ever worked a well-known club there. I replied that I likely couldn’t get my foot in the door there, but I knew someone who probably could. When I asked Mundell if he knew the club owner, he said, “Of course, quite well. Why don’t you and I book some dates up the coast and work our way down to L.A.?” He didn’t have to ask twice. I called contacts in Washington and Oregon, and Mundy booked some gigs in Northern California. We spent two weeks traveling in a van together, staying with friends in a few towns or in hotels along the way, and finished in L.A. That was in 2004, when Mundell was a very young 82 years old. He was the most easygoing, pleasant traveling companion I’ve ever encountered, and the stories he told about times with Charlie Parker, Billy Taylor, Mingus, Miles, Peggy Lee, Sarah Vaughan and many others were amazing. He talked about meeting Bill Evans when Bill was still in college in Mississippi. Bill later called when he got to New York and asked Mundy if he’d like to do some trio gigs. He agreed and asked Bill if he knew any good bass players. Bill said there was a new guy out in Jersey named Red Mitchell—so the first Bill Evans Trio was with Mundell and Red. After that trip we recorded a duo project together, which we released in 2007. Also around this time Mundy started taking me along to play the W.C. Handy Music Festival. Over the years at Handy, I loved playing and hanging out with Mundell and his great longtime friend Lloyd Wells. Mundell was always so kind and generous. Knowing and working with him was a joy and an honor. Read George Varga’s Overdue Ovation profile of Mundell Lowe from the December 2008 issue of JazzTimes. Read Lloyd Wells’ Farewell tribute piece to Mundell Lowe from the March 2018 issue of JazzTimes.